Conceptually, the Inca Creator God, so-called “WIRACOCHA” - with the original Turanian name of “BİR GÖK AĞA”, had two aspects. In one, he was the personification of the Inca universal Creator Sky-God concept who is regarded as the creator of all things in the universe; and in the other, he was the personification of MAN – (from Turkish word MEN/BEN meaning Turkish “ADAM”), that is, “the human being” with the creator teacher image. In this context, he was the Great Lord and Instructor of the World. And, he was the “BİLGEMİŞ” of the ancient Turanian Tur/Turk/Oguz peoples - (Turkish “AGILGAMIŞ” – the Semitized so-called “GILGAMESH”); and the so-called “HERAKLEUS” of Greeks (whose name is from the Turkish saying “ER AKLI US” meaning “man’s mind, intelligence, knowledge and wisdom”); and the Semitized so-called “MELCART or MILQARTU” of the ancient Turanian “GÜNHAN TURKS” who were alienated with the name “PHOENICIANS” and their Tur/Turk/Oguz identity was altered by the Greeks. The word “MELCART or MILQARTU” was the alienated Turkish words “BİLGEDİR” (BİLGETUR) meaning “it is man of knowledge and wisdom” and also Turkish word “BİLGİDİR” meaning “it is science, knowledge and wisdom”. Similar to these definitions in Turkish, the Inca God name WIRACOCHA was also the personification of a researcher, a scientist, an engineer, an architect, a sculptor, a doctor and many other men of wisdom who were all trained, educated and enlightened by the WIRACOCHA - (“BİR GÖK AĞA”) the Teacher. The Inca God VIRACOCHA (also WIRACOCHA) has titles that seem to be alienated from the original language of the Inca peoples. I will present them below with their given definitions and their decipherments and thus identify their meanings. “PACHAYACHACHIC: South American – An Inca creator-god. Father of Imaymana Viracocha and Tocapo Viracocha. He is regarded as a form of Pachacamac but, in other accounts, is said to be the same as Tici. Also known as Pachayachachic, Pachacamac, Earth-maker, Pacharurac, Teacher of the World, Ticci Viracocha, Tici, Aymara Yatin. Another name for VIRACOCHA is given as Wiracocha Pachayachachic: Great Lord and Instructor of the World. Now let us understand these terms by explaining their meanings in the context that they are given in the above reference citing. 1. PACHAYACHACHIC is “An Inca creator-god. Father of Imaymana Viracocha and Tocapo Viracocha. He is regarded as a form of Pachacamac”. When the name PACHACAMAC is deciphered as “PACH-ACAMAC”, it reveals the altered form of the Turkish saying “BAŞ OKUMACI” meaning “the Head Reader”. This refers to persons who are the best readers and instructors in the fields of reading, writing and teaching, that is, “The Teacher” of the world. 2. Also known as PACHAYACHACHIC. When the name PACHAYACHACHIC is deciphered as “HCH-PACH-ACAYACI”, it reveals the Turkish saying “EÇE BAŞ OKUYUCI” meaning “the Great-Man is Head Reader”. Where the letter H is is voiced as He or E, letters CH are a replacement for Turkish letter Ç, and also a replacement for letters SH which is Turkish letter Ş. This again refers to persons who are the very best readers and instructors in the fields of reading, writing and teaching. Turkish word EÇE means the eldest person of the family, thus, a great-man or great-woman, BAŞ means “head”, OKUMAK means “to read” , OKU means “ read”, OKUMA means “reading”, OKUMACI means “he who reads; reader” and OKUYUCI also means “he who reads; reader”. Indeed, the Inca PACHACAMAC the Earth-maker or the Teacher is an “Earth Maker” by way of all the people whom He/She together with Mother Nature teach, enlighten and mold into special “knowledge and skill” forms as teachers, scientists, art workers and specialists. They are all creations of teachers – in Turkish “BİLGEMİŞ” or presently “ÖĞRETMEN”. From these explanations, we see that the Inca term PACHACAMAC is not only related to the Turkish language, but also made up from Turkish words that have been altered. When the name PACHARURAC is deciphered as “PACH-ARAUC-R”, it reveals the Turkish saying “BAŞ ARAYUCU ER” (BAŞ ARAŞTIRICI ER, BAŞ BİLGE KİŞİ, BAŞ FENCİ ER) meaning “the Head Research man, the best scientist”. This again refers to persons who are the very best research people and scientists in many fields. In this case, the Turkish word ARAMAK means “to search”, ARA means “search”, ARAMA means “searching”, ARAYUCU means “he/she who studies any unknown concept by way of research (inspecting, testing and experimenting in many ways, and recording his/her findings) and makes enlightening explanations about the studied subject”. For this he/she may go far and wide to search the explanation of his/her subject. Thus, he/she is a “BİLGAMISH” person who also teaches what he/she fınds. Turkish word ER means “man; person”. Additionally, when the term PACHARURAC is deciphered as “PACHARUCA-R”, it reveals the Turkish saying “BAŞARUCU ER” meaning “men or women who make successful findings from their research”. This refers to people who have become successful in their fields. With their achievments, they become teachers of the world by teaching and enlightening others in the world with their speeches, writings, products and creations. However, in doing all of these activities, one needs to use one very important means of communication which is a formalized human LANGUAGE. Without a language, (a tongue) man is mute and speechless. With language, man comes alive and takes the position of a creator god! In this definition, the terms “ILLA TICCI” have a specific enlightening meaning which is very important to the God VIRACOCHA, that is, the Teacher of the world. That specific meaning is found when we decipher the terms “ILLA TICCI” into Turkish as follows. 4.1 The Inca terms ILLA TICCI, when deciphered as “TAICILIC-L”, reveals the Turkish saying “DEYİCİLİK” meaning “act of speaking, speech making”, that is, “speaking with a language”. Turkish word DE means “say, speak, talk”, DEYİ means “word; what is uttered”, DEYİCİ means “he who speaks words”, DEYİCİLİK means “act of speaking, speech making”. Thus, we see that these two altered and alienated words (ILLA TICCI) were actually derived from the rearrangement of the Turkish word DEYİCİLİK. 4.2 Furthermore, when the terms “ILLA TICCI” are deciphered as “TİLCİLİC-A”, they reveal the Turkish saying “DİLCİLİK” (Dilcinin yaptığı iş) meaning “act of a linguist; speaking, speech making, speaking one or more languages, studying languages and many other linguistic related works”. Thus, the Inca term ILLA TICCI WIRACOCHA, deciphered into Turkish as “TAICILICL VIR-COC-AHA”, reveals the Turkish saying “DEYİCİLİKLİ BİR GÖK AĞA” (DİLİ OLAN, KONUŞAN BİR GÖK AĞA) meaning “One Sky Lord who speaks with a language”, that is, “One Sky Lord who enlightens with his language”. This brings to mind the question: What was that language that the Inca Creator Sky God the World Teacher spoke? Surely, by explaining all of these linguistic riddles in Turkish alone, it can be said with confidence that the first language that the Inca god WIRACOCHA spoke was most likely the Turkish language! Turkish word DİL means “language, the word; tongue, mouth”, DİLCİ means “he who speaks, he who explains by speech, he who enlightens by speaking, he who knows one or more languages”, DİLCİLİK means “he who acts as a linguist”. 5. The Inca God PACHAYACHACHIC is also known by the saying “TİCİ VİRACOCHA”. 5.1 Similarly, when the title name TICI VIRACOCHA is deciphered as “TeİCİ VİR-COC-AHA”, it reveals the Turkish saying “DEYİCİ BİR GÖK AĞA” (KONUŞAN BİR GÖK AĞA, SÖZCÜ BİR GÖK AĞA) meaning “One Sky Lord that speaks”. Indeed presently, “Man is one-sky-lord that speaks”! Thus, we see that with this “INCA” term TICCI or TICI VIRACOCHA, i.e., personifying the World Teacher concept, is a saying that has been made up from a Turkish saying which describes ancient Turanian Tur/Turk/Oguz people who had a monosyllabic and agglutinative language of their own which was the Turkish language as these decipherments indicate. Furthermore, we can confidently say that MAN is indeed “ONE SKY MAN” who is described in Turkish by saying “BİR GÖK AĞA” meaning “One Sky Lord”. This concept is also known with Turkish sayings “BİR GÖK HAN (one sky Lord), BİR GÖK ER (one sky man), BİR GÖK TUR (one sky Tur/Turk), BİR GÖK KÖZ (one sky glowing fire), BİR GÖK GUZ (OĞUZ) (one sky Oguz), and BİR GÖK TANRI” (one sky God) who has been assumed to have been living in the sky and travelling through the SKY for aeons. 5.2 We are also told that the name PACHAYACHACHIC of the Inca Creator-God is also known by the name TICI. The term TICI, separated as “TIC-I” is very much the Turkish saying “TEK 1” meaning “Only One” which refers to the Sky-God Concept in Turkish. 5.3 Additionally, as I noted above, this Inca term TİCİ is also a form of the Inca term TİCCİ having the same meaning as TİCCİ. Thus in this context, the term “TİCİ” is again an altered form of the Turkish saying “DEYİCİ” (KONUŞUCU, DİLCİ, SÖZCÜ, AĞUZCU) meaning “speaker, he who speaks; he who has mouth and tongue”. Indeed, that is what man is! And that is also what WIRACOCHA was. In this context, the Inca word KON is none other than the Turkish word GÜN meaning the “Sun” which is unquestionably a “Divine Energy,” and the the word TIKI is the Turkish word “TEKİ” (GİBİ) meaning “like, similar”. Thus, the Inca term “KONTIKI” becomes the Turkish saying “GÜN TEKİ” (GÜN GİBİ) meaning “like sun” (sun like). Thus, it implies that any divine energy would be “sun like energy”! It appears that those who came up with these so-called Inca terms and their definitions, are avoiding linking the “Inca” word KON with the SUN (GÜN in Turkish). They even go as far as identifying KON (CON) as the Storm God. Inca Creator-God PACHAYACHACHIC is also known by the saying CON TİCİ VIRACOCHA. When the INCA saying CON TİCİ VIRACOCHA is deciphered as “CON TeİCİ VİR-COC-AHA”, it reveals the Turkish saying “GÜN DEYİÇE BİR GÖK AĞA” meaning “One Sky Lord who speaks Sun Language”, that is, “One Sky Lord who speaks Turkish”. This identifies the Inca people as Sun Language (Turkish) speaking Tur/Turk/Oguz people. After all, the Inca people called themselves The Children of The Sun. The Inca word CON is none other than the altered form of the Turkish word GÜN meaning “sun”. Thus it is expected that the Inca people, as “The Children of The Sun”, would be the speakers of a “ SUN LANGUAGE”, that is, a “GÜN DİLİ”. Interestingly, the language of the Inca people is presently called QUECHUA. The name QUECHUA, deciphered as “QUACHE-U”, reveals the Turkish saying “GÖYÇE O” (GÖKÇE O) meaning “it is in the language of Sky”, that is, a “sky language”. Surely, the SUN LANGUAGE TURKISH is a SKY LANGUAGE. After all, the ancient Turanian Tur/Turk/Oguz people believed in the concept of “BİR GÖK AĞA” (BİR GÖK TANRI), just like the Inca people did, which makes Turkish a Sky Language. In one earlier study of mine regarding the language of Celtics, Scots and Picts, I had noted the name “GÖYÇE O” (GÖKÇE O) meaning “it is in the language of Sky” shown in the link just below. The Turkish saying “GÖK TÜRKÇE” of the ancient GÖK TÜRKs is an unquestionable example of this! 7.1 IMAYMANA WIRACOCHA (where W represents VY), when deciphered letter-by-letter as “MIN VIR COC AY-AHAYAM-A”, reveals the Turkish saying “MEN BİR GÖK AY-AĞAYIM” meaning “I am one Sky Moon Lord”. Ancient Turanians also believed in the Moon God and in this context, WİRACOCHA also identifies himself with the Moon-God. The Moon is also a creation of the Sky-God VIRACOCHA, that is, “BİR GÖK AĞA”. The Incas were not just worshippers of the SUN. They also worshipped the MOON. Turkish word MEN means “I, I am”, BİR means “one”, GÖK means “sky; blue”, AY means “moon”, AĞA means “lord”, AĞAYIM means “I am the Lord”. 7.2 Additionally, when the title name IMAYMANA WIRACOCHA is deciphered as “MIN-COC-ARAYAU-AHAIUM”, it also reveals the Turkish saying “MEN KÖK ARAYU AĞAYIM” meaning “I am the lord who searches the roots of things and writes it”. In the context of being “he who inquires and seeks the truth”, this Turkish saying refers to those who are scientists who make inquiries (search) about the makeup of everything in nature and then record them. And in this context, I say the IMAYMANA was a personification of the creator teacher god WIRACOCHA wherever he went! This is very much like the name of ENKIDU in ancient Turanian BİLGAMESH epic story. The name ENKİDU is the altered form of the Turkish saying “KENDİ O” meaning “it is the body (self) of Bilgamesh” where the story name BILGAMESH is the personification of “BİLGİ”, that is, the knowledge and wisdom of man. Turkish word KÖK means “root”, ARAYU (ARAYAN) means “he who searches, he who studies”. 8.1 The term TOCAPO (TUCAPU) is an altered form of several homonyms in Turkish and thus has several meanings associated with it in Turkish. In one it stands for the Turkish saying “TOKUYUP” (DOKUYUP) meaning “he/she has woven” implying tapestry, rugs and similar other things that are woven by people. And Turkish word “TOKUMAK” (DOKUMAK) means “to weave”. Inca TOCAPO images are QUOMPI weavings, that is, small square-woollen weavings that each have a certain symbol of a picture-writing system. Many of these symbols are woven on a flat medium such as the face of a textile or rug. I will explain the Inca term QUOMPI further below. 8.2 In the second meaning, the word TOCAPO, deciphered as “OCOTAP”, is the altered form of the Turkish word “OKUTUP” meaning “he/she has had it read” which refers to a “book”. A book can be read by many people or taught to many people, and thus, its contents are transfered to students in schools. A book is carried by the teacher – and that is why TUCAPU, the younger son of Wiracocha, goes wherever Wiracocha – the world teacher goes. Thus the Inca saying Tucapu (Tocapo) Wiracocha has the following meanings in Turkish. 8.4 TOCAPO WİRACOCHA deciphered as “VIR O COC AHA TOCUAP” is the Turkish saying “BİR O GÖK AĞA DOKUYUP” meaning “only that One Sky Lord has woven”. This refers not only to the Creator Sky-God concept who has woven a universe with all of its complexities, but also refers to the ONE GÖK AĞA (ONE GÖK HAN) Lord who invented “weaving” and done with it wonderful things such as Inca tapestries and Ponchos for wearing and for “writing” or QUOMPI weaving. 8.5 TOCAPU WİRACOCHA deciphered as “VIR O COC AHA OCUTAP” is the Turkish saying “BİR O GÖK AĞA OKUTUP” meaning “only that One Sky Lord has taught”. This refers not only to the creator Sky-God concept as the creator of the universe, but also refers to the One Sky Lord - “BİR GÖK AĞA” (BİR GÖK HAN) Lord who invented “writing” and “reading” - and who educated and enlightened the people of the world. Thus, TOCAPU WİRACOCHA is surely a Great Lord and Instructor of the World. 8.6 TUCAPU WİRACOCHA deciphered as “CUTAPU OCUR-CUI-AHA” is the Turkish saying “KİTABU OKUR GÖY AĞA” meaning “the Sky Lord reads the book”. It is no wonder that WİRACOCHA the Great Teacher of the world, that is, “GÖY (GÖK) OKUR AĞA”, took “TUCAPU (TOCAPO) with him wherever he went. After all, He, that is, the Teacher god (or goddess), took his woven Poncho with himself to wear and also took his book with him to read and even to write. 8.7 TOCAPU deciphered as “CUTAP-O” is the Turkish saying “KİTAP O” (BİTİK O) meaning “it is book”. Obviously WİRACOCHA the Great Instructor of the World took his book with him where ever he went. The Inca Creator God WIRACOCHA PACHAYACHACHIQ was also known by the name ATUN-VIRACOCHA. 9.1 When the INCA saying ATUN VIRACOCHA is deciphered as “ATUN VİR-COC-AHA”, it reveals the Turkish saying “ADIN BİR GÖK AĞA” meaning “your name is one Sky Lord” which deifies the name “VIRACOCHA”. 9.2 Additionally, when the INCA saying ATUN VIRACOCHA is deciphered as “VİR-OCUTANC-AHA”, it reveals the Turkish saying “BİR OKUTANCU AĞA” meaning “one teacher lord” which then identifies the god VIRACOCHA as being a teacher! This Turkish definition is again in line with the saying that VIRACOCHA was a Great Lord and Instructor of the World indicating that Inca sayings were very much related to Turkish language sayings. The Turkish word AD means “name”, ADIN (ADUN) means “your name”, OKU means “read”, OKUTAN means “he/she who teaches”, OKUTANCU means “teacher, one whose work is teaching”. When the Inca saying CONTITI VIRACOCHA PACHAYACHACHIC is deciphered letter-by-letter as “CON TITICH VİR-COC-AHA PACH-ACHAYACI”, it reveals the Turkish saying “GÜN DEDİÇE BİR GÖK AĞA BAŞ OKUYUCU” (“GÜN DİLÇİ BİR GÖK AĞA BAŞ OKUYUCU) meaning “in Sun Language, One Sky lord is Head reader” which identifies the god VIRACOCHA being the Top Reader as teacher! This Turkish definition is again in line with the saying that VIRACOCHA was a Great Lord and Instructor of the World. This again indicates that Inca sayings were very much related to Turkish language sayings. In all of these sayings, there is one rather very subtle fact that has been hidden by verbal puns. That is the Turkish word BAŞ (TEPE) meaning the human “HEAD” which is what does all of the reading, writing, speaking, thinking, searching, creating, describing, defining, knowing, saving, and utilizing knowledge for his purpose. Just as the SUN and the SKY-GOD create, heat up and light up the world, so too does the human head create, think, speak and teach everything - thus enlightening people of the world! In other words, knowledge enlightens while lack of knowledge darkens! Viracocha is the great creator deity in the pre-Inca and Inca mythology in the Andes region of South America. Full name and some spelling alternatives are Wiracocha, Apu Qun Tiqsi Wiraqutra, and also Con-Tici Viracocha. https://en.wikipedia.org/wiki/Viracocha. Polat Kaya: This Inca saying APU QUN TIQSI WIRAQUTRA, deciphered as “APU QUN-VIR–UQUTAR-QISITA”, reveals the altered and restructured Turkish saying “APA-GÜN BİR OKUTUR KİŞİDİ” meaning “father-Sun is one teaching man”. Man not only needs the light and the warmth of the sun to be here on earth, he also needs the light of the Sun to read and write. Similarly, we all need the enlightening knowledge and wisdom of our teachers to learn and advance and possibly be teachers ourselves. Additionally, the Inca saying APU QUN TIQSI WIRAQUTRA, deciphered as “APU QUN-VIR–UQUTAR- QISTI-A-”, reveals the altered and restructured Turkish saying “ABA GÜN-BİR OKUTUR KIZDI O” meaning “Mother-Sun is one teaching girl”. Surely, we have both men and women teachers in our schools. This mixture makes the great Teacher of the World WIRACOCHA, that is, “BİR GÖK AĞA” (BİR GÖK HAN), metaphorically, the highest hermaphroditic creator god. In other words, a mixture of men and women teachers! Additionally, man does not know whether GOD is male or female. God has been assumed as a Him or a Her or an It - indicating all of these forms as being in a single unified entity. That is why the GOD concept is expressed with the Turkish term “O” meaning He/She/It without any gender in Turkish! So, not only do we need the Sun and sunlight for life and learning, we also need men and women to teach reading, writing and the accumulated knowledge about everything. The Turkish words GÜN (Sun), GÜNEŞ (Sun and Sunlight) and IŞIK (Light) are names that are used as names by men and women in Turkish culture. Turkish word APU (APA) means “father”, ABA (EBE) means “girl; woman”, QUN (KUN, GÜN) means “sun”, IŞIK means “light”, BİR means “one”, O means “he/she/it; that”, OKU means “read”, OKUMAK means “to read”, OKUT means “have him/her to learn reading writing, knowledge”, OKUTUR means “he/she who teaches reading, writing and knowledge”, OKUR means “he/she who reads; student”, KİŞİ means “man”, KIZ means “girl” and AĞA means “lord, ruler, the head man”. The expression WIRACOCHA PACHAYACHACHIQ has embedded in it at least two more Turkish sayings that are very descriptive of the concept of WIRACOCHA PACHAYACHACHIQ who is also said to be the Great Lord and Instructor of the World. This identifies the Inca God as nature and also a teacher who instructs others. 12.1 In this context, when the expression “WIRACOCHA PACHAYACHACHIQ” is deciphered letter-by-letter as “VIR-U-COC-HCH-AHA PACH-AQAYACI”, it reveals the Turkish expression “BİR O GÖK EÇE-AĞA BAŞ OKUYUCU” meaning “that One-Sky-Great-Lord is the Head Reader.” With this decipherment into Turkish, we find that WIRACOCHA PACHAYACHACHIQ is not only “One Lord of Sky, but He is also the Great Lord Head-Reader/Teacher of them all”. In this context, he is the personification of the Sky-God and also the personification of enlightened men or women (who read and learn deep knowledge about the different aspects of nature on earth and in the sky) as research people who enlighten the world with their knowledge and wisdom. http://www.polatkaya.net/Inca_Quipu.htm with the title of “THE NAME OF INCA STRING-WRITING SYSTEM CALLED “QUIPU” IS FROM THE TURKISH SAYING “İP OKU” MEANING “STRING READING”. Polat Kaya: In my view, the Inca term so-called “QUOMPI weaving” or TUCAPU is an Inca writing system written on tapestry rather than on paper, that is, on textile or on fine rug like weavings which are used as tunics worn by nobles and also by other high ranking personalities. The writings on TUCAPU weavings may identify persons wearing them, their functions and what they have done in their life, or historical events. Inca symbols - (i.e., DAMGA in Turkish) representing numbers, single letters, syllables and short names are woven into small squares put side-by-side on the face of tapestry. When they are read in a proper right-to-left or left-to-right fashion, they make a mono-syllabic agglutinative writing system that is similar to the Turkish language. The TUNIC (word made up from Turkish word TAKI) is worn externally by putting the head through an opening at the center. The term QUOMPI deciphered as “IP-OQUM” is the altered form of the Turkish saying “İP OQUMA” (İP OKUMA) meaning “string reading” or reading system written on rugs or tapestry. Of course, while the “QUIPU” is reading by knots on a string, QUOMPI is the writing and reading of knots built on the surface of a rug or tapestry. It is no wonder that Turks have the earliest woven rugs in the world with many symbols embellished on them. The ancient Turanian Tur/Turk/Oguz peoples, when they invented a writing system with pictures and geometrical figures, they must have chosen the wool based rugs and tapestry as a durable writing medium. By having large stocks of sheep, they had ample amounts of wool to be used for all kinds of wearing purposes. Using it as a writing medium must have been one of the important developments. In addition to rock faces on the rocky mountains, the Inca rugs would provide plenty of portable writing material instead of “paper”. They claim that the Incas did not have a writing system. I say this is a deliberate denial of the Inca reading and writing culture. I have just shown that the Inca QUIPU string writing, and the Inca QUOMPI or the TOCAPU (TOKUMA/DOKUMA in Turkish meaning “weaving”, or, KITAB/BITIK in Turkish meaning “book”) were all symbols used in their writing system. QUIPU was a one dimensional writing system using knots on strings but QUOMPI was a two-dimensional medium to write on. Inca tapestry and Turkish tapestry are not only the earliest tapestry, but they are also almost identical in their geometrical images (see below images). Examples of TUCAPU / TOCAPO – (TOKUMA / DOKUMA). 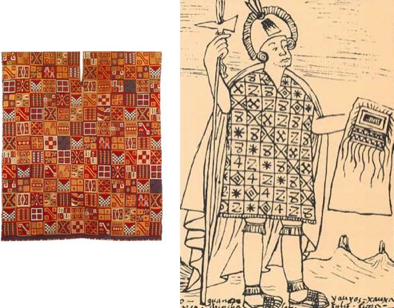 The top left graphic is a tunic, with a slit for the wearer's head to go through and, top right, Guamán Poma's drawing of Wiracocha Inca wearing such a tunic. With these revelations, the Inca god “WIRACOCHA PACHAYACHACHIC” is none other than the ancient Turanian God of science, knowledge and learning, the Turko-Sumerian King-God “BİLGAMİŞ” (also known by the name of “GILGAMESH”), the so-called “MELCART” (MILQARTU) – that is, Turkish “BİLGEDİR” - meaning “it is man of knowledge and wisdom of the ancient Turanian “GÜNHAN TURKS” (so-called “PHOENICIANS”), and he is the so-called “HERAKLEUS” (from the Turkish saying “ER AKLI US”), meaning “man’s mind, intelligence, knowledge and wisdom”. With all of these, when we reexamine the INCA picture of WIRACOCHA as shown above, we can see that he is a teacher in a classroom. His head is adorned with a sun crown from which all kinds of enlightening knowledge and creations are emanating from his head - as if they were the ever lighting rays emanating from the Sun. Most likely, each ray represents a different subject of teaching. Human knowledge enlightens men like the sun rays lighten up the world. At his feet, there is his desk and also the sitting children whom he teaches. He has in his hands, two “teaching aides”. I identify the one on the left as a ruler – (that is, CETVEL in Turkish) and the one on the right as a pair of compasses – (that is, PERGEL in Turkish). Both of these items are used by teachers to demonstrate geometric figures or mathematical measurements, etc.. They are NOT lightning bolts as we are led to believe. So, with all of these revelations, we now have a new understanding of the Inca God WIRACOCHA as being the Sky God and also the great teacher of the world and world maker!